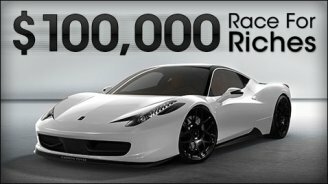 Carbon Poker have brought back their popular Race for Riches promotion again – but this time with a little twist! Instead of offering their traditional single-month race like in the past, Carbon have now extended Race for Riches over the course of two months. From the beginning of July to the end of August, players will be competing for $100,000 worth of cash prizes. This Race for Riches will be broken down into eight races, with each offering a $12,750 prize pool. The top 250 Race Points earners in each period will receive cash, and first place collets $2,000. All you need to do to earn Race Points is play in Carbon ring games, SNG’s and MTT’s. Now here’s a look at the specifics of the $100k Race for Riches. You can multiply your Race Points by playing in designated tourneys throughout each week. Every select tournament that you play in results in a 0.1 multiplier. So if you played in two of the events listed below, you’d receive a 0.2 multiplier. Assuming you earned 1,000 points during a given race period, you’d now have 1,200 points courtesy of the 0.2 multiplier.